This summer has been incredibly difficult for our brothers and sisters in Israel. Instead of vacationing with their families or making memories at day camps, most Israeli children have spent the sunny days hiding in bomb shelters and learning more than their fair share about the Iron Dome missile defense system. Instead of jumpstarting their careers or focusing on basic training, thousands of young men and women have found themselves on the front lines of the war in Gaza. It has been a very long and challenging summer, to be sure. But as the war slips into its second stage, Jews around the world are sharing inspiring stories, anecdotes of extreme charity and unprecedented displays of brotherhood that have taken place over the last few weeks. These stories buoy our spirits and help us remember just how fortunate we are to be members of “the Tribe.” Since I spent some time in Israel during the war, I have a few stories of my own, and one in particular stands out above the rest—a life-altering moment that I experienced in the rocket-battered Negev city of Sderot. The story actually begins in January, with a phone call from Yossi Baumol, executive director of the American Friends of Sderot. Yossi explained that he was in dire need of a Torah for an Ethiopian Synagogue in Sderot. The congregants had been using ritually unfit Torahs until that point, and they were pining for a kosher Torah to call their own. I immediately got on the case. Dr. Joe Rozehzadeh, Simon Jacob, and I decided to dedicate the Torah in memory of Joe’s father, my father, and Simon’s father-in-law. 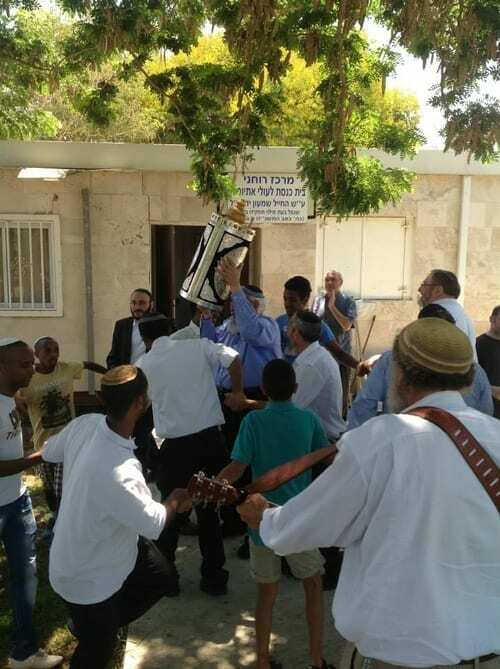 Promptly, a Torah was on its way to Sderot. Joe, Simon, and I postponed the Hachnasat Sefer Torah (Torah dedication ceremony) until all three of us could be in Israel together. After much discussion, we settled on Friday morning, Aug. 8 (the eve of Shabbat Nachamu) as the date for the ceremony. As the war unfolded, we made a conscious decision to stick to our plan. Not only did we want to see it through, but it dawned on us that a celebration of this kind was more important during a war than at any other time. We were committed to giving our Torah a proper homecoming and standing in solidarity with the citizens of Sderot when they needed us most. On the morning of Aug. 8, Nachum Segal Network general manager Miriam Wallach, Joe, Simon, and I arrived in Sderot with an entourage of family and friends. Though we were overcome with excitement, we were also somewhat nervous because there had been several air-raid sirens that morning. Later, we would realize that while sirens rang out immediately before and after the event, not one sounded while we were actually singing and dancing with the Torah. The first thing we noticed was that the “synagogue” was actually a trailer with a capacity of no more than 30 people. The congregants, Ethiopians spanning generations, were beaming with joy and pride. In addition to genuine excitement about the Hachnasat Sefer Torah, it was clear that they were simply thrilled to have a reason to celebrate outdoors on a sunny day. In a city plagued by aerial terror, moments such as these were not taken for granted. All at once, we began. The small group gathered together, dancing with the Torah at the entrance to the synagogue as we raised our voices in song. Israeli musician Yehuda Katz joined us for the ceremony, and his sweet vocals and instrumentals helped set the mood. As the members of the congregation chose one song after another, we were pleasantly surprised by the selections. We had assumed that an Ethiopian synagogue would mark the occasion by singing melodies that American Jews couldn’t possibly know, and we were all prepared to just hum along and clap when it seemed appropriate. It turned out, however, that their Hachnasat Sefer Torah set list matched our own without exception. The universality of the custom was moving. As we danced together in the summer heat, we were overcome with emotion. Who would have guessed that a Sephardic Torah would be dedicated by a group of American Jews to an Ethiopian synagogue in Israel? But at that moment, it made perfect sense. All of the labels melted away and all that was left were Jews, members of a single family, celebrating a shared heritage in their beloved homeland. This point was driven home one last time when we began packing up to head back to Jerusalem. As we turned to bid our hosts farewell, we opted for Hebrew, the only common language between us. Only when we began wishing one another “Shabbat Shalom” did we realize just how fitting it was that our parting words would be in our shared, ancestral tongue. That uplifting and unifying moment, marked with warm smiles and hearty handshakes, is one that I won’t soon forget. As we took our leave, the enormity of what we had experienced overwhelmed me. We had witnessed the ingathering of the exiles firsthand. We had established meaningful connections with a community that otherwise felt abandoned. We had contributed to the rebuilding of the Jewish homeland at a pivotal moment in Jewish history. Obviously, we could have dedicated our Torah to any number of synagogues. But after that special wartime morning in Sderot, it was clear to me that our fathers would have been very happy with our selection. This Torah paved the way for a bright and united Jewish future. Jewish radio icon Nachum Segal, is the host to JM in the AM – Jewish Moments in the Morning,’ the #1 Jewish Talk Radio Show in the world and the radio program of record in the Jewish community for over 30 years.